April's African football news in brief. In-form Brentford striker Mohamed Said Benrahma faces a race against time to regain full fitness in a bid to force his way into the Algeria squad for the Nations Cup in Egypt. The 23-year-old injured his ankle in Brentford's 2-1 defeat at Reading in the Championship last week which brought his season to an early end. The former Nice player scored ten goals in Brentford's Championship campaign. Benrahma has made only one appearance for Algeria, in a friendly international against Senegal in October 2015. Former Guinea captain Aboubacar Barath Camara will be buried in Conakry on Friday, according to the country's football federation. Camara, who became a football administrator after retiring from playing and served as secretary general and executive member of the football federation, died in Conakry on Sunday after long illness. The qualifying campaign for the 2020 African Nations Championship (CHAN) begins on Saturday with two games in the Southern Zone. Botswana are looking to put behind a disappointing 2019 Africa Cup of Nations qualifying behind them as they host Seychelles in the qualifiers for the tournament for locally-based players. In something of a surprise Botswana's caretaker coach of Mogomotsi Mpote left out national team defender Mosha Gaolaolwe, who is moving to South African second-tier side TS Galaxy. In Saturday's other CHAN qualifier Malawi travelled to eSwatini, who like Botswana finished the Nations Cup qualifying without a win. The remaining 10 teams in the Southern Zone take part from the second round with three nations from the region qualifying for the finals in Cameroon. Sevilla will become the first Spanish club to play in Tanzania when they face either Simba of Yanga on 23 May. The local sides will play each other for the right to take on the La Liga side at the Dar es Salaam national stadium. The visit is part of the LaLiga World Challenge, which is funded by betting company SportPesa, which aims to boost the image of Spanish football internationally. "As a global competition it is a commitment for LaLiga to be close to its supporters fans and so that our Tanzanian fans can enjoy close a great club like Sevilla FC," Oscar Mayo, director of International Development at LaLiga, explained. English Premier League side Everton, who are also sponsored SportPesa, narrowly beat Kenya's Gor Mahia in a friendly that was also played in Dar es Salaam. The Nigeria Football Federation (NFF) has confirmed Ghana's decision not go ahead with a proposed friendly in early June at the Stephen Keshi Stadium in Asaba. However the Super Eagles are expected to face Senegal in Egypt as planned ahead of the 2019 Africa Cup of Nations. The NFF's general secretary Mohammed Sanusi said that plans are underway to find an opponent to replace Ghana. "Our team will face Senegal in Egypt before the start of the Nations Cup tournament," Sanusi told BBC Sport. Decision of the Ghana FA's normalisation committee to opt out of the game will come as a huge setback for Nigeria coach Gernot Rohr. Rohr had said he was expecting to play friendly matches against two serious contenders for the title, Senegal and Ghana, in the run up to the tournament. Guinea will play two friendly matches as they prepare for the Africa Cup of Nations in Egypt. According to the Guinea Football Federation the Syli Nationale will face Benin on 11 June in the Moroccan city of Marrakech, where they will begin a training camp on 1 June. They will depart for Egypt on 15 June and face the Nations Cup hosts Egypt in Alexandria a day later. Guinea are in Group B alongside Nigeria and newcomers Madagascar and Burundi and they'll be based in Alexandria. Tunisia's national team doctor Souheil Chemli says Zamalek midfielder Ferjani Sassi will be fit to play for the Carthage Eagles at June's Africa Cup of Nations. The 27-year-old midfielder will miss the rest of the Egyptian club's season picking up an injury in the Confederation Cup playing for Zamalek. "Sassi will undergo surgery on Wednesday (17 April), we have no choice, surgery is the best choice," Chemli explained. "He will be ready to be with the national team at Afcon and will be available for the first match, but will not be able to play with Zamalek before that." DR Congo international Jean-Marc Makusu will be out of action for at least two months ending his hopes of playing at the Africa Cup of Nations in Egypt. The 27-year old striker suffered a double break of his left leg as his AS Vita side drew 0-0 with FC Renaissance in a local league game in Kinshasa on Sunday. He helped AS Vita club finished as runners-up of last season's Caf Confederations cup netting 11 goals including one in the final return leg match against Morocco's Raja Casablanca. Makusu scored five goals in this season's Caf Champions league qualifying and group stages before Vita club were knocked out of the competition. Guinea defender Pa Momodou Konate has played just his eighth game in the last two years. The 24-year-old made his debut for Swedish club GIF Sundsvall as he bids to revive his career. He played for 89 minutes providing an assist for his side in their 3-1 loss to Elfsborg in the Swedish top-flight on Sunday. The Sweden-born player's last competitive game was for Cincinnati against Indy Eleven in the USA's second-tier on 29 September last year. Konate played for Sweden in friendly internationals before switching allegiances to Guinea, where his father is from, and will hope to force his way into their squad for the Africa Cup of Nations. Tunisia international Ferjani Sassi is in a race against time to be fit for the Africa Cup of Nations after picking up an injury in the Confederation Cup playing for Zamalek. The 27-year-old midfielder will miss the rest of the Egyptian club's season the Tunisia Football Federation (FTF) confirmed. He broke a bone in his heel as Zamalek clinched a semi-final place with a 1-0 win over Morocco's Hassania Agadir. The Egyptian club has agreed Sassi can return to Tunisia so the FTF can oversee his recovery as he bids to be able to play at June's Nations Cup in Egypt. Cameroon striker Vincent Aboubakar has returned to training with Porto after stepping up his recovery from a knee injury. The 27-year-old underwent surgery in September after suffering a ruptured anterior cruciate ligament (ACL) in his left knee. Both his club and country have had to do without the player after a long spell on the sidelines, but his return comes as a boost for the Indomitable Lions ahead of the 2019 Africa Cup of Nations in June. "Aboubakar is fully available now for the team. Another thing is for him to have the ability and pace to perform in a match situation," says Porto boss Sérgio Conceição. "We are being careful not to rush him back into full action." Aboubakar was the hero as Cameroon came from behind to beat Egypt 2-1 and seal a fifth Africa Cup of Nations title in February 2017. The absence of Aboubakar, a key figure in Porto's first league title triumph in five years last season when he scored 15 goals, has been a major blow for the Portuguese side who face Liverpool in the second-leg of their Champions League semi-final next week. Guinea international Issiaga Sylla has extended his contract with Toulouse until June 2023, the French Ligue 1 club announced. "Toulouse is delighted once again to be able to count on the services of a player who has gone through its training centre," the club said on its website. It comes five days after the 25-year-old left-back scored Toulouse's only goal against Nantes in a 1-0 home victory. Sylla has played 18 out Toulouse's 31 Ligue 1 games so far this season, scoring two goals. He joined Toulouse in the 2012/2013 season from Guinean club Horoya at the age of 18, but started with the club's feeder team in the lower division where he had three spells. Sylla made his Ligue 1 debut the same season before he was loaned to another French side Ajaccio three years later. He returned to Toulouse in the 2016/2017 season. At international level, Sylla made his debut for Guinea in September 2011 and went on to play in the 2015 Africa Cup of Nations in Equatorial Guinea, helping the Syli Nationale to the reach the quarter-finals. The versatile defender is hoping to feature in his second Nations Cup in Egypt in June. Cameroon striker Eric Maxim Choupo-Moting escaped uninjured from a car accident on his way to training with his French club Paris St-Germain on Thursday. Choupo-Moting took a full part in the club's training session on Thursday, it came in a bad week for the striker. Four days earlier he was guilty of one of the worst misses in the history of football as Paris St-Germain squandered the chance to wrap up the Ligue 1 title against Strasbourg. The Ivory Coast Football Federation has begun a search of a new coach of its team of locally-based players to allow Ibrahim Kamara to concentrate on the full national team. Kamara had been in charge of both the Elephants and the team that plays in the African Nations Championship (CHAN) but the federation want him to prepare the senior side for June's Africa Cup of Nations finals in Egypt. Former Monaco, Roma and Blackburn Rovers forward Shabani Nonda has started construction at his football academy in Kinshasa. The building project is expected to take two to three years with the former DR Congo striker quoted as saying this is his way to "give back to his country". Guinea's Horoya have written to the Confederation of African Football (Caf) to complain about the officiating in their Champions League quarter-final first leg. Horoya's protest centres on two incidents where they feel the officials should have awarded penalties during their goalless draw with Morocco's Wydad Casablanca. Tanzanian club Simba have also written to Caf to question a late change to the officials allocated to the second leg of their tie against DR Congo's TP Mazembe. Simba claim it is "unprecedented for Caf to change referees after the first leg match has been played for unknown 'technical reasons." The Tanzanians want the previous officials to be reassigned to the second leg of the tie which is also goalless after the first leg. Algerian club JS Kabylie have sacked Lyes Benyoucef and Juba Oukaci after they were found guilty of cocaine possession. The pair were arrested in the early hours of Saturday and they were handed a two month suspended jail sentence on Monday. 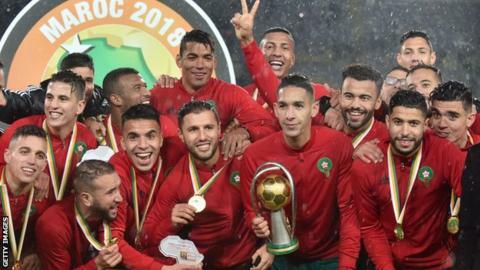 This is just the latest case in Algerian footballers involving cocaine including Youcef Belaili, who had a four-year ban reduced to two after he failed a test in 2015. Second half goals from Janine Beckie and Sophie Schmidt helped Canada to a 2-1 win over Nigeria in a women's friendly on Monday in Spain. Desire Oparanozie had given African champions Nigeria a first-half lead in the World Cup warm-up fixture at Pinatar Arena. The last meeting between both countries was at the 2011 World Cup in Germany where Nigeria won a dead rubber group fixture (1-0) as both teams had already missed out on advancing to the knockout round. The Super Falcons, nine-time winners of the Africa Cup of Nations, have qualified for all eight editions of the Women's World Cup. Canada chose to play the strongest African team, Nigeria, in a friendly ahead of their World Cup opener against Cameroon in France. Sierra Leone striker Kei Kamara's goal in Colorado Rapids 4-3 loss at Orlando City was his 115th goal in Major League Soccer (MLS). It takes him to fifth on the all-time MLS scoring list, as he overtakes retired USA forward Ante Razov. "To be honest it was never my goal, I have just been enjoying my game and floating with joy. I always know the goals will come when I am enjoying my game," said after the match. He was also asked whether he had his sights on breaking Landon Donovan's MLS all-time goal scoring record of 145 goals. "No my eyes have always been on winning a championship. I am looking forward for one of my good friends (Chris) Wondolowski to break that record and I will celebrate with him," he replied. Wondolowski, who plays for the San Jose Earthquakes, is just one goal behind Donovan on 144 goals. Kamara is now 18 goals behind Bolivia's retired forward Jaime Moreno, who is the highest-placed overseas player on the list. Senegal's Moustapha Diallo has left French club Nimes by mutual consent because of injury. Senegal international Moustapha Diallo was honoured by his former club Nimes on Saturday, performing a ceremonial kick-off to get the team's Ligue 1 home match with Caen underway, which they won 2-0. It came little more than two weeks after the 32-year-old midfielder left the French club by mutual consent because of a career threatening ankle injury. Diallo featured only seven times in Ligue 1 this season after joining in July last year, and his last match was against Montpellier on 30 September 2018. Born in Dakar, Diallo has been capped four times by Senegal since 2007. He started his club career with Senegalese club ASC Diaraf where he had two spells. He also played for Club Brugge in Belgium and Spanish club Racing de Ferrol before joining French club Guingamp where he spent ten seasons, helping them gain promotion to Ligue 1 in 2013. Swedish Damallsvenskan side Rosengard have signed Nigeria striker Anam Imo from Nasarawa Amazons on a two-year deal. The 18-year-old scored eight goals to emerge top scorer in the 2018 Nigeria Womens Premier League season. She starred as Nigeria won a ninth title at the 2018 Africa Women's Cup of Nations in Ghana and was named the 2018 Nigeria's Young Player of the Year [Female] at the Nigeria Football Federation awards in Lagos. "[Imo] Anam can play both as striker and wingback," said Rosengard's sports director Therese Sjogran. Anam Imo joins compatriots Rita Chikwelu, Ogonna Chukwudi, Ebere Orji, Halimatu Ayinde, Osinachi Ohale, Faith Ikidi and Ngozi Okobi in the Swedish league. The Guinea coach Paul Put has set out his plans for the national team as they build up to this year's Africa Cup of Nations in Egypt. The Syli Nationale are one of 24 teams that will take part in the newly expanded tournament. Coach Put said his team would begin preparations in Conakry before travelling to Marrakech in Morocco for a two-week training camp on 3 June. The team will depart Marrakech for Egypt on 17 June, with the Nations Cup kicking off on 21 June. Guinea finished top of their group in the Africa Cup of Nations qualifying campaign, ahead of Ivory Coast, Rwanda and Central African Republic. The Gabon Football Federation (Fegafoot) has begun advertising for a new national team coach and a technical director. A deadline of 22 April has been set for applications for both jobs. One of the targets set by Fegafoot for the new coach is to qualify for the 2021 Africa Cup of Nations in Cameroon. Fegafoot are looking for a new coach after deciding not to extend Daniel Cousin's contract after he failed to lead the Panthers to this year's Nations Cup finals. Burkina Faso defender Edmond Tapsoba has extended his contract with Portuguese club Victoria Guimaraes until 2022. The 20-year-old, who joined Guimaraes last season, has a release clause of US$22.5 million in his new contract. He has featured regularly for Guimaraes B team in the Portuguese second tier and has been an unused sub for two of the senior team's matches so far this season. Tapsoba was with Burkinabe clubs Salitas and US Ouagadougou before moving to Portugal to join Leixoes in July 2017 and later transferred to Guimaraes. Reigning African champions Nigeria will face Canada in an international friendly on 8 April in the Spanish city of Murcia ahead of the 2019 Fifa Women's World Cup in France. Before the game against the North Americans, the Super Falcons are expected to play Spanish club UMF Selfoss on 4 April before flying to a training camp in Austria, according to the Nigeria Football Federation (NFF). For the 2019 global event, Nigeria have been drawn in Group A alongside 2019 hosts France, Norway and South Korea. "Both matches will prepare the team for what to expect in France later this year," NFF spokesman Ademola Olajire told BBC Sport. Their best performance at the global event came when reaching the quarter-finals in 1999, losing narrowly to Brazil, yet they have exited the last four tournaments at the group stage. Guinea Bissau have made a formal bid to persuade Zinho Gano to commit his international future to their cause ahead June's Africa Cup of Nations finals in Egypt. The 25-year-old attacker plays for Belgian league leaders Racing Genk and has been a regularly used off the bench this season as his club seek a first championship since 2011. Gano is Belgian born but his father hails from the former Portuguese colony, who are headed to their second successive Nations Cup finals after qualifying last month. Genk have confirmed the approach from the Guinea Bissau Football Federation but the club did not reveal whether Gano is keen on the switch. Guinea Bissau would have to apply to Fifa for Gano to switch international allegiance if he agrees to make the choice as he has played for Belgium at youth level. Former Monaco and CSKA Moscow striker Moussa Maazou has joined struggling Saudi Arabian top-flight side Ohod until the end of the season as a free agent. The 30-year-old Niger player had been without a club since he terminated his contract with French club Lens by mutual consent in December. He missed Niger's final 2019 Africa Cup of Nations qualifier against Egypt, which ended 1-1, because he was without a club. The much-travelled Maazou has played for clubs in Niger, Belgium, Russia, France, Portugal, Tunisia, China and Denmark. Moroccan international Noussair Mazraoui has signed a new contract with Dutch club Ajax, which will will now run until July 2022. The 21-year-old right back, who had been linked with a move to Italy, said he was "very happy to have signed with this great club." Ajax's football director Marc Overmars has expressed his happiness that Mazraoui has decided to stay with the club. "Noussair is only 21-years-old and can play in several positions. Of course he could still go abroad, but it is good that he thinks that a longer stay at Ajax is best." French club Le Havre have confirmed that Algeria midfielder Victor Lekhal will miss the rest of the season after rupturing his cruciate ligaments in his right knee. The injury means the 25-year-old is a doubt for the Africa Cup of Nations after making his debut for Algeria against Tunisia in a friendly last week. It is the third time that Lekhal has suffered from such an injury. South African Premier Soccer League midfielder Sinethemba Jantjie has been killed in a car accident. The 30-year-old played for Free State Stars and had agreed a deal to sign for Bidvest Wits for next season. League football in Sierra Leone is still attracting big crowds two months after it kicked off following a four-and-a-half year absence. Sunday's match between East End Lions and FC Kallon, owned by former Inter Milan forward Mohamed Kallon, had to be delayed for an hour due to overcrowding. Freetown's Siaka Stevens Stadium was full to capacity hours before kick off despite an increase in ticket prices and European league matches involving teams such as Liverpool, Spurs, Chelsea and Real Madrid being shown on TV. Such was the the appetite for the game that supporters were turned away from the stadium. Those who did get into the stadium ended up forcing their way past the perimeter fence round the pitch and began climbing the floodlights in search of vantage points. Security had to be increased to ensure the fans left the pitch so that the game could begin. The match eventually ended 2-0 in favour of the away team East End Lions to the disappointment of Mohamed Kallon, who had flown from USA to watch the game. Sierra Leone vice-president Dr Juldeh Jalloh was also in the capacity crowd.